in Rawalpindi. Woman on left is unidentified. (AP Photo/B.K. Bangash) RAWALPINDI, Pakistan - U.S. authorities questioned suspected Sept. 11 attack mastermind Khalid Shaikh Mohammed on Monday, seeking information about safe houses and hideouts used by the al-Qaida terror network, a Pakistani intelligence official said. Mohammed was captured in a house in Rawalpindi as he slept early Saturday, culminating a longtime manhunt for the No. 3 man in Osama bin Laden's network. Pakistani Ahmed Abdul Qadus and an unidentified Somali man were also detained. Officials described a feverish final hunt for Mohammed after narrowly missing his capture in the rambling frontier city of Quetta last month. With help from the CIA on interrogations and intercepted messages, police ended the hunt with Saturday's blistering raid in Rawalpindi, outside the capital Islamabad. There were conflicting reports of Mohammed's whereabouts. Senior Pakistani officials have told The Associated Press on condition of anonymity that Mohammed has been whisked out of the country and is in U.S. custody. Publicly, however, the government denies it has turned him over. Pakistani investigators are asking him "why was he in Pakistan, what he was doing here and what were his linkages," Interior Minister Faisal Saleh Hayyat told reporters Monday. Security officials said the pursuit for Mohammed heated up after authorities arrested an Egyptian man in the frontier city of Quetta on Feb. 14. Authorities had hoped to find the top al-Qaida figure, but he was not there. A top police official in Quetta said the arrested suspect changed his story many times during questioning, but finally identified himself as Abdul Rehman, from Egypt. The official said police were aware that another suspect got away, but were not told of his significance. The police later handed Rehman over to Pakistan's intelligence agency, known as ISI. The second suspect arrested in Rawalpindi with Mohammed has not been named, but the senior government official said he was "also proving to be an important man." Hayat said the man was a Somali national, but declined to identify him. Mohammed, 37, is perhaps the most senior al-Qaida member after bin Laden and his deputy, Ayman al-Zawahri. He allegedly organized the Sept. 11 terror attacks, and was linked to a 1995 plot to bomb trans-Pacific airliners and crash a plane into CIA headquarters. He also has been tied to the April bombing of a synagogue in Tunisia, which killed 19 people, mostly German tourists. On Sunday, Qadus' family vehemently denied he was involved in terrorism and insisted he was alone at home with his wife and children when authorities burst in around 3 a.m. Saturday. They said about 25 heavily armed agents, some in civilian clothes and some in blue uniforms, stormed into the house, rifling through drawers and pointing their guns at the children. They quickly took Qadus away and kept his wife and children under guard in a small bedroom as they searched the house, Qadus' sister, Qudsia Khanum, said. Agents, all of whom appeared to be Pakistani, took a computer hard-drive, documents and U.S. dollars from the house, the family and security officials said. Khanum said the computer had no Internet hookup and that her brother didn't even know how to use it. "He is slow, and he is so innocent and friendly, it is inconceivable that he could be involved in intrigue. People run rings around him because it would never occur to him that they might lie or take advantage of him," she said from the family's living room in an upscale neighborhood of the city. Qadus' father, Abdul Qadus, is a prominent microbiologist who worked in Africa for the World Health Organization for many years before retiring, Khanum said. The 42-year-old Qadus, however, could not hold down a job and had lived at home with his parents his entire life, she said. 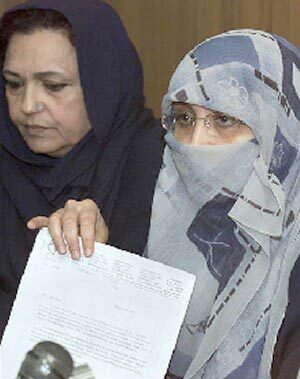 Qadus' mother, Mahlaqa, is a local leader of Jamaat-e-Islami, one of the main hardline religious parties in Pakistan. The family speculated the arrest was a political ploy to discredit her and the party, which is part of an ultraconservative coalition that came in third in last year's parliamentary elections, largely on the strength of a virulently anti-American platform. "Arabs, Afghans, Sudanese, it is not a sin to host them as guests, unless their crime is proven," he said when asked whether Qadus or his family had links with al-Qaida. Interior Ministry spokesman Iftikhar Ahmed brushed off the family's claims, saying Qadus, Mohammed and the third man were all arrested at the family's home.